Bentley Continental T, 1997, #SCBZU23CX VCX53458, Mulliner Park Ward Coupé. Brake discs had been increased in size and do give the Bentley Continental T a stopping power of 4.96 seconds from 100 mph to 0 mph. The determination to leave no gap in their range of luxury high performance cars was the driving force to diversify by adding one more Driving Force. 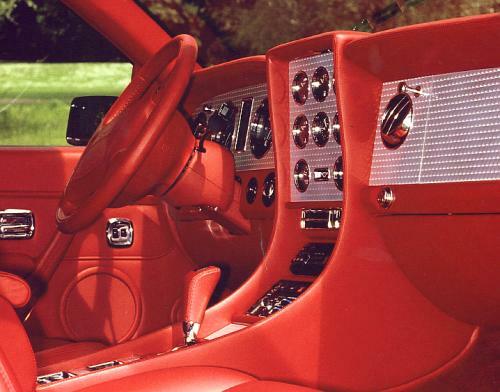 Performance and handling of the 1996 Bentley Continental T were without equal. As regards torque: 590 lb/ft (800Nm; from 1997 650 lb/ft 875Nm) positioned this car at the top. There existed no other passenger motor car in the world which came even near this figure - with one exception, the Bentley Turbo R Sport's engine delivered 553 lb/ft. The Bentley Continental T was a 2+2 coupé developed from the Bentley Continental R with a more athletic outward appearance due to a 4 in (10 cm) shorter wheelbase and extended front and rear wheel arches. The driver found an engine-turned dash with chrome finish instruments as a delicate reminiscence of the heyday of the British Racing Green Bentleys handled with verve by the 'Bentley Boys' - and as it had been during these heroes' time the Continental T's engine responded to a separate push-button starter. Introduced in 1999 the Bentley Continental T Mulliner could be specified by a discerning Bentley driver as an out and out sports car - by comparison to the basic model - with almost no compromise. Modified shock absorbers in combination with stiffer torsion bars (front +40%, rear +20%) did permit to use the engine's most impressive power even under conditions, which previously might have been considered as beyond the limit.